A Roman inspired 18ct yellow gold love-bead charm necklace. This is a bespoke necklace inspired by a much loved piece of costume jewellery. 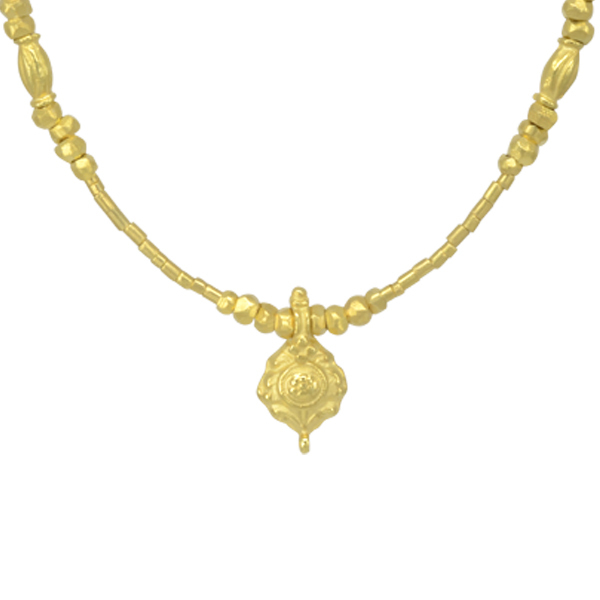 It is handmade as beads from small faceted pieces of tube like a classic love-bead necklace with added faceted gold nugget round beads and hand carved longer beads and charms. Strung on really strong tigertail nylon coated 49 strand wire with a handmade 18ct yellow gold S catch. If you have an idea for a piece of jewellery that you would love to commission and enjoy, call our designer today on 01273 846338.